One of the greatest perks of being a tutor in LSW/GED is when a student passes his/her last test. There are often screams, usually hugs, and most always, tears of joy on the faces of both tutor and student. 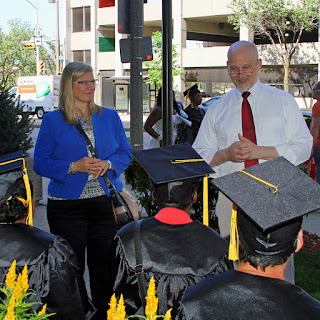 These emotions are even more intense at the citywide GED Commencement at MATC, which I experienced on June 1st. As a retired professional portrait photographer, I am always excited to photograph the cap and gown portraits of our LSW grads which have now been added to the wall of honor in our GED area of Literacy Services. The students take this portrait most seriously, arranging hair around the cap, straightening ties, and untangling tassels. It moves me to tears seeing the smiles on those faces. I don’t even have to work to get a good expression because the sheer elation and relief shine through on this happy day. Often their children are present and their faces beam with pride at the happiness of their parents. The most moving part of the ceremony for me was when one of the speakers, a 47-year old mother, had a hard time getting through the emotional parts of her speech. At one point when she commented that she didn’t think she was going to make it in life, she broke down completely. From the midst of the throng of graduates came, “And girl, look at where you are now!” The crowd erupted into cheers and she smiled and carried on with her speech. 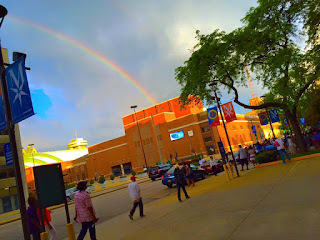 As the graduates, families, and friends flowed out onto 6th Street after the moving ceremony, they were greeted by a huge and vivid rainbow arching over the Milwaukee Theatre. If that isn’t a fantastic omen for these amazing graduates, I don’t know what is!